Saint Ansgar, also Anskar or Oscar, (September 8?, 801 – February 3, 865) was an archbishop of Hamburg-Bremen known as the "Apostle of the North" and the patron saint of Christianity in Scandinavia. A native of France, Ansgar devoted himself to a spiritual life while still a boy after seeing a vision of his deceased mother with the Virgin Mary. In his twenties he became a missionary, first to Denmark and then Sweden, where he met with mixed success among the native pagan population. In 831 he was appointed archbishop of Hamburg and later of Bremen. Political divisions of the Frankish lands after the death of Louis the Pious and the sack of Hamburg by the Danes dealt him severe setbacks in the early 840s. Later, he was able to establish amicable relations with certain Scandinavian monarchs and succeeded in establishing a number of churches. He died in Bremen in 865. After Ansgar's death, his successor, Rimbert, preserved several of his visions together with his brief biography. Although his churches in Scandinavia were destroyed by later pagan reaction, Ansgar's saintly memory preserved his permanent legacy. In Catholic, Orthodox, and Episcopal tradition, his feast day is celebrated on February 3, when he is remembered as the apostle of Scandinavia. Ansgar was born in Amiens, France. After his mother’s early death he was brought up in nearby Corbie Abbey, where he made rapid progress in his education. According to the Vita Ansgarii ("Life of Ansgar"), as a young boy received a vision in which he learned that his deceased mother was in the company of the Virgin Mary. As a result, his formerly careless attitude toward spiritual matters quickly changed to one of absolute seriousness. 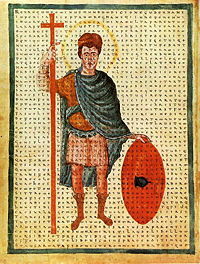 Ansgar was a product of the phase of Christianization of Saxony, present day northern Germany which had begun under Charlemagne and continued by his son and successor, Louis the Pious. In 822 Ansgar was one of a number of missionaries sent to found the abbey of Corvey (New Corbie) in Westphalia, and there became a teacher and preacher. After Saxony's Christianization was more or less completed, Ansgar and other missionaries looked further north for fresh fields in which to sow the seeds of the Gospel. When Harald Klak, the newly baptized king of parts of Denmark, returned to his country from exile, Ansgar went with him. 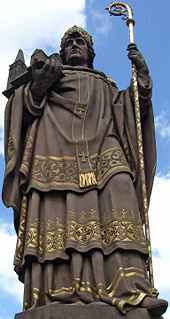 Ebbo, the archbishop of Reims, had previously attempted missionary work there without much success. Ansgar founded a school at Schleswig in South Jutland, but his activities provoked storm of opposition from the local inhabitants, resulting in the expulsion of Ansgar and other missionaries from the area. He then returned returned to the Frankish realm. In 829, Louis appointed Ansgar missionary to Sweden, in response to a request from the Swedish king Björn at Hauge for a mission to the Swedes. Although the delegation was attacked on its way and was thought to have abandoned its mission, Ansgar succeeded in entering the country. He was favorably received by the king and given permission to preach. 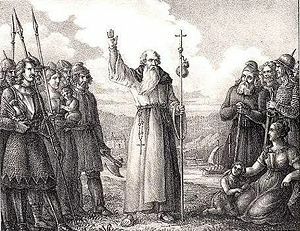 With an assistant, the friar Witmar, he made converts for six months at Birka on Lake Mälaren. They organized a small congregation there, with the king's steward, Hergeir, as its most prominent member. In 831, Ansgar returned to Louis' court at Worms and was appointed archbishop of Hamburg in 831. Hamburg, a new archbishopric, was given the right to send missions into all the northern lands and to consecrate bishops for these territories. After being consecrated in November 831, Ansgar went to Rome to receive the pallium, the symbol of his papal authority. He received pallium directly from the Pope Gregory IV, who named him papal legate for the northern lands. This position had previously been bestowed upon Ebbo of Reims, but the jurisdiction was now divided by mutual agreement, with Ebbo retaining Sweden. For a time Ansgar devoted himself to the needs of his own diocese, which was still considered missionary territory with only a few churches. He revived the abbey of Turholt in Flanders and established a school there. After Louis the Pious died in 840, his empire was divided, to Ansgar's disadvantage. As a result, Ansgar lost possession of the abbey of Turholt. Taking advantage of the divided Frankish kingdom, Horik I (Eric), the king of Danes of Jutland, unexpectedly sent a fleet of 600 ships and sacked Hamburg in 845. Seeing Christianity as the religion of the their enemy Harald Klak, the marauding Danes seized or destroyed the treasures and books of Ansgar's churches, and the entire diocese was left in ruins. Moreover, Ansgar was now without a means of collecting revenue to carry out his duties. For some time was even a fugitive and was also deprived of his Flemish possessions by King Charles the Bald. Many of Ansgar's assistants now deserted him. However, Charles the Bald's adversary, Louis the German, came to his aid. After failing to recover Turholt for him, the king awarded him the vacant diocese of Bremen, where Ansgar took up residence in 848. This, however, aroused the anger of the bishop of Cologne, to whom Bremen had been subject. Despite the political turmoil of the late 840s, Ansgar continued his mission to the northern lands. He finally even established good relations with his former bitter enemy, Horik I. During this time, he was able to secure the official toleration of Christianity and established a church in Sleswick. He also influence Horik and his son Horik II to mitigate the horrors of the slave trade, while not eliminating it completely. Ansgar also devoted his energy to the Swedish mission, spending two years there in person (848-850). This proved to be a critical moment when once again a pagan reaction threatened, which Ansgar succeeded in averting. Ansgar returned again to Sweden during the reign of king Olof in Birka c. 854. This king was well disposed to Christianity, and Ansgar's biographer even relates that during a raid against in Courland ("Aputra"), the still partly-pagan Vikings even prayed for and received God's help in plundering the the country and slaughtering its inhabitants. Among the works credited to Ansgar is the introduction of bells in the worship of the northern churches, an innovation that particularly impressed the pagans, who considered them as instruments of magic. He was eminent for his piety, asceticism, and observance of the monastic Rule of Saint Benedict. He built hospitals, ransomed captives, and sent alms abroad. His one expressed regret was that he had not been found worthy of martyrdom. Finally having achieved a measure of success, Ansgar eventually returned to Bremen, where he died in 865. Almighty and everlasting God, you sent your servant Anskar as an apostle to the people of Scandinavia, and enabled him to lay a firm foundation for their conversion, though he did not see the results of his labors: Keep your Church from discouragement in the day of small things, knowing that when you have begun a good work you will bring it to a fruitful conclusion... Amen. Written by his successor Rimbert, the Vita Ansgarii preserved the outline of Ansgar's biography and several legends associated with his missionary activities. It also records Ansgar's visions, which encouraged and assisted Ansgar's missionary feats. In Rimbert's account a divine vision precedes each stage of Ansgar's career. For example, his early studies and ensuing devotion to the ascetic life of a monk were inspired by a vision of his mother in the presence of Virgin Mary. Later, in his travels northward, he was led by a vision to the abbot Adalhard, who would instruct him in what was to happen. 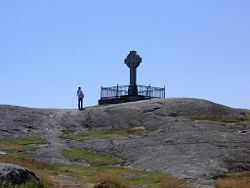 Statues dedicated Ansgar stand in Hamburg and Copenhagen as well as a stone cross at Birka. A crater on the Moon, Ansgarius, has been named for him. Ansgar is the patron saint of Denmark. He is known in Germany as Saint Scharies. His feast day is February 3. All links retrieved April 2, 2016. This page was last modified on 28 April 2016, at 15:31.